Since the Industrial Revolution, companies have continued to operate without putting a value on natural resources. 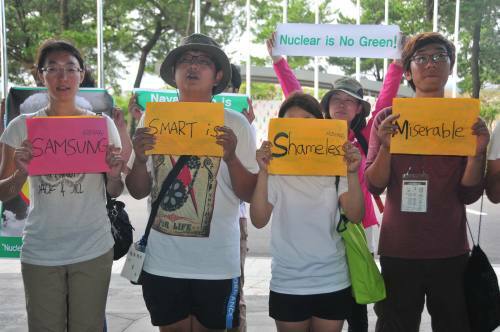 JEJU, South Korea , Sep 17 2012 (IPS) - As ravenous consumers of natural resources, companies are beginning to recognise that they owe a monetary debt to the planet, and are sharpening their pencils to calculate it. In 2004, when the International Union for Conservation of Nature (IUCN) held its four-yearly World Conservation Congress in Bangkok, Thailand, there were only two major business leaders attending it, recalled Peter Bakker, the current president of the World Business Council for Sustainable Development (WBCSD). “In 2008, in Barcelona, Spain, there were a few more. This time, the first thing you see when you enter (the congress site) is the business pavilion,” Bakker told Tierramérica*. Bakker takes the conspicuous presence of private enterprises at this year’s congress, held Sep. 6-15 in Jeju, South Korea, as an indicator of the role businesses can play in saving the environment and creating sustainable growth. When the first United Nations Earth Summit took place in Rio de Janeiro in 1992, the big novelty was the WBCSD, which ensured the presence of the private sector in environmental discussions. The prevailing view at the time was that private companies were the worst enemy of nature. Two decades later, that thinking has undergone a major shift, with large multinationals like cement giant Holcim and medium-sized companies like Sri Lanka’s Dilmah tea company all showcasing their nature-friendly side at the congress. But good intentions are not enough. Experts like Bakker say that businesses need to embrace change and recalibrate the way they carry out operations. A big part of the change would be considering their impact on their surroundings as a key factor in the decision-making process. One of the most important steps forward would be to evaluate and eventually put a value on the impact on nature made by each company, big or small. “Many companies have had a steep learning curve on assessing their impact on the environment,” said Bakker. The WBCSD top official said that as companies take into account their imprint on the world they operate in, costs are likely to rise, especially if changes are implemented. “One of the biggest challenges in the future will be to analyse the impact on natural capital. How are we going to value natural capital?” he asked. It will not be easy in a world where natural resources like water usually carry zero value. Pavan Sukhdev, author of the new book Corporation 2020: Transforming Businesses for Tomorrow’s World, also supports the idea that companies need to quantify and put a monetary value on their impact on nature. Sukhdev told Tierramérica that since the Industrial Revolution, companies have continued to operate without putting a value on natural resources. He is calling for a regulatory change whereby accounting standards are changed to reflect a company’s impact on its surroundings. “The accounting bodies need to be telling companies that they need to report natural capital impact,” he said. Even change within big companies, like Walmart, can only reach a limited section of the global population, but if regulatory systems can be changed, that will be reflected across the board, said Sukhdev. The author touched a sensitive nerve by stating that companies need to look at a business model that not only creates profits but also human, social and natural gains. One of the global giants that claim to be doing this is Puma, the shoe and sportswear company, which is updating its accounting methods to include “the cost to nature of doing business,” said company representative Holly Dublin. Puma contracted the consulting firms PricewaterhouseCoopers and Trucost to prepare an Environmental Profit and Loss Account, applied for the first time in 2011. In the first stage, the tons of greenhouse gases emitted and cubic metres of water consumed in its business and operations throughout the supply chain were calculated and valuated. The first results revealed a sum of 185 million dollars in impacts on ecosystems and the environment during 2010. Water consumption and greenhouse gas emissions accounted for roughly 121 million dollars in impacts. The rest, calculated during a second stage, corresponded to changes in land use for the production of raw materials, air pollution and waste, primarily in the supply chain. Puma plans to adopt full accounting of environmental and social costs and benefits which will also encompass acid rain and smog precursors, volatile organic compounds, fair wages, employment creation and tax contributions, among other factors. Since the first estimate of impacts was calculated, the company has set a target of achieving 100 percent sustainable packaging and a 25 percent reduction of carbon, energy and water use by 2015. Dublin said that since the conclusion of the United Nations Conference on Sustainable Development (Rio+20) in June, Puma has been overwhelmed by interest shown by other companies in its new accounting system. But in order for everyone to have access to this new tool, “it has go open source,” she commented. However, if changes like these are to have a wider impact, one more factor is important, stressed Bakker: the role of businesses in fast-growing economies like India, China and Brazil. With a combined population of over three billion, these countries need to take a firm stand that they will not compromise on environmental well-being to achieve rapid development. “If we can’t get these countries to develop sustainably, then we have no hope,” he said. Bakker believes that the growing economies have the chance to jump to the next level of nature-friendly technologies, such as mobile phones over fixed lines, or alternative energy sources like wind and solar rather than reliance on thermal power generation. “If they copy the consumerism of the West, we are in trouble,” he said. The WBCSD has already calculated the damages of such consumerism. In the last 50 years, 60 percent of the world’s ecosystem services – such as freshwater, fiber, food, climate regulation, flood control, water purification and waste treatment – have been degraded, according to a new WBCSD report released here in Jeju. The costs of ecosystem degradation are huge: for example, between two and five trillion dollars in ecosystem services are lost each year just from deforestation, reveals the study “Biodiversity and Ecosystem Services: Scaling Up Business Solutions”. Nature, it appears, has a steep price tag.